St. James Lights are made from the purest copper in the world. Custom Designs in Copper or Steel are Welcome! All Light Fixtures are ETL Certified and all Electrical Components are U.L. Certified. Burners and Valves are Solid Brass. Other Materials used are 16, 20 and 32 ounce Copper! Gas option is available. The St. James Sun Valley Copper Pendant Lantern is a custom design lantern that is also available in gas, propane, 1-4 Candelabra or Edison bulbs, custom quote #950. As with all St. James Lighting copper lanterns/chandeliers we ship free to the mainland USA and we have unbeatable prices and low prices on brand name copper chandeliers as well as our low price guarantee. We are one of the top home improvement sites in the country and if you have copper lighting questions just ask our Trusted Lighting Experts for help! As with all our St. James Lighting copper lanterns/chandeliers we SHIP FREE to the mainland USA and we have unbeatable prices and low prices on brand name copper chandeliers as well as our low price guarantee. We are one of the top home improvement sites in the country and if you have copper lighting questions just ask our Trusted Lighting Experts for help! You will find many great buys on discount copper chandeliers and all kinds of copper lighting here at Teton Lighting! Why Choose a St. James Lighting Copper Lantern/Chandelier? 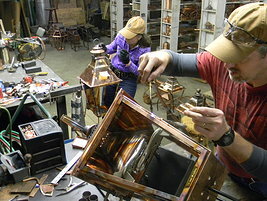 St. James Lighting are made from the best copper mined in the U.S., which has a projected life of 300 years. Less expensive zinc or aluminum metals are not used. Expensive copper brazing rods are used versus cheaper soldering methods and an expensive riveting machine is used versus cheaper and faster pop rivet methods used by many.